Why are curbless showers the new rage in bathroom renovations? Function: A curb is a barrier intended to act as a water dam. If that’s happening, it means the drain is clogged and needs to be cleaned. If you like to turn on the shower and empty the hot water into a clogged drain, then a curb is a good idea for you. For the rest of the population, a curb is a daily trip hazard in a slippery zone – not the best situation. For anyone with the potential to develop balance, vision or mobility concerns in the next 20 years, freedom to enter and exit without a step to navigate is a big help. It also happens to be a necessity for anyone using a wheelchair, but no one needs to wait for that to consider going curbless. Think about where nasty buildup occurs in your shower – it always starts in a corner. Fewer corners is cleaner and better. Appearance: Look to places like Houzz, Architectural Digest, or any of the many home designer magazines and you’ll discover thousands of curbless showers in new and bathroom remodels. These publishers tend to promote luxury living, but many of the elements are within reach of most consumers. The reason they look better is due to the cleaner lines created that open up the space and make the room feel bigger. For a bathroom, that’s a big bonus, and it doesn’t require moving any walls. Economic: The materials to build a curbless shower are the exact same as a curbed shower, so no dramatic cost differences there. Some reinforcing may be required, if there are adjustments required for the subfloor structure, but these are usually quite straight forward for qualified contractors who use a structural engineer. Installing a secondary drain at the transition is a good backup for a clogged primary drain, for not much added cost. On the plus side, the equity improvement for a bathroom remodel pays big dividends to daily home-life and home equity. An updated bathroom is always a key benefit if selling the home is likely at any point down the road. 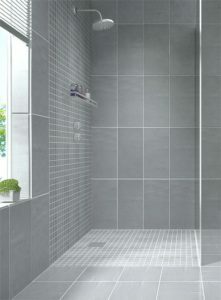 We recommend curbless showers for seniors Aging in Place, as this allows to function normally in the home for many years. Limitations: Size is the main limiter. To be effective, one dimension usually needs to be at least 42 inches, except for all-in-one designs where everything gets wet. These are uncommon in North America, but they are very common in Europe and Australia. They make a lot of sense in some situations, and we’d be happy to discuss that idea as well. Sub-Floor is the other consideration. Concrete slabs will require jackhammering a trench or raising the entire floor up the room up higher, which usually moves the step, albeit smaller, from the shower to the doorway. If there are steel or engineered wood beams under the shower, then raising the room floor is likely the most practical option. Basements may not be an ideal location, in the event of a sewer backup.